Get a bird’s-eye view of the world with this DJI Phantom 3 camera drone. Offering unrivaled image quality and maneuvrability, this camera drone includes smart object avoidance and easy control using your iPhone or iPad. 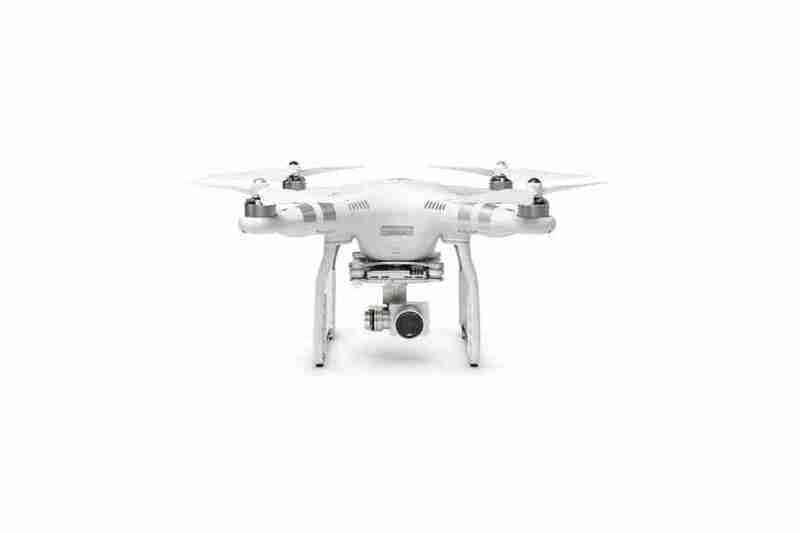 You can also select a target with this DJI Phantom 3 camera drone and track it automatically. •Easy to Fly: An intelligent flight system automatically keeps your Phantom 3 Standard in the air and under your control. •Amazing Images: Take stunning 2.7K HD videos and 12 Megapixel photos with the integrated aerial camera. •Stable Footage: DJI’s advanced gimbal stabilization technology gives you movie-quality results no matter how you fly. •Enjoy the View: A live video feed gives you a 720p HD real-time view of what your camera sees right on your mobile device. •Peace of Mind: Fly up to 25 minutes on a single charge, and the Intelligent Flight Battery will automatically remind you when power is running low. The FAA requires operators of unmanned aircraft weighing more than 0.55 pounds (250 grams) on takeoff (including everything on board or attached), and operating outdoors, be registered at www.faa.gov/uas/registration.